Transfer Voice Memos from iPod touch to Computer Local. Transfer voice memos from iPod touch to computer easily. 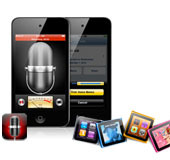 "Use iPod touch you can capture a thought, a memo, a meeting or any audio recording with Voice Memos. When you are done, edit your recording, then sent it via email or MMS. The first thing you must do is search for best and easy to use software to transfer voice memos from iPod touch to computer. So now we recommend professional program called 3herosoft iPod to Computer Transfer can help you out of this trouble completely. It can allow you to transfer voice memos from iPod to computer, or transfer them to iTunes in an easy way." How to transfer voice memos from iPod to computer? You can transfer voice memos from iPod to computer with 3herosoft iPod to Computer Transfer, and you can easily send these voice memos by E-mail and MMS, or edit in your computer. And the following guidance will tell how to easily transfer voice memos from iPod to computer. Download this iPod Voice Memos Transfer software and run it. Once you connect iPod touch to computer, you will see all information about your iPod, such as Type, Capacity, Version, Serial Number, and Format that be shown on the main interface. 1)Click "Voice Memos" icon under iPod list and all voice memos files are shown in file browser. 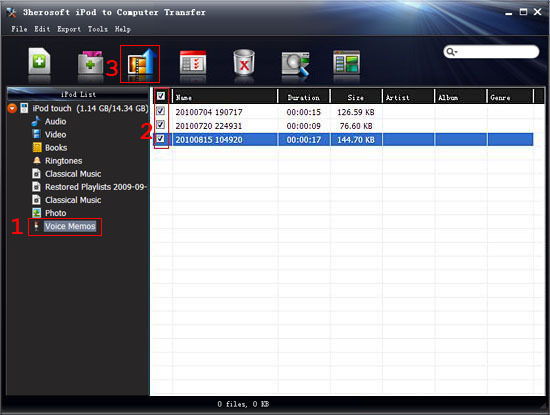 2)Locate the files you want to transfer and check them for ready to export. 3)Click the "Export->Export to local" on the top-menu, or directly click "Export the checked to local" button (show as picture below) to transfer voice memos from iPod to computer. And select the directory folder to save the iPod files in the pop-up dialog window. Then you will see the copy progress in the pop-up dialogbox. 4)After a few minutes, the selected voice memos can be transferred successfully from iPod to computer.